How much have things changed? The previous “big 4” journals that had citations to ASCL entries have been joined by AJ and the percentage of citations from MNRAS has dropped a bit, but overall, the wedges of these two piecharts, one from October, 2015 and the second from today, look remarkably similar. 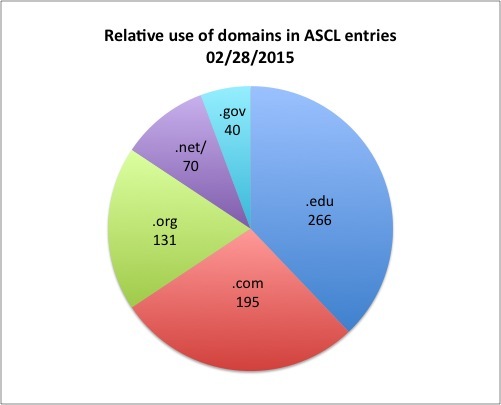 At the time the 2015 piechart was created, ASCL entries had been cited 465 times; today, ADS shows 2093 citations to ASCL entries. 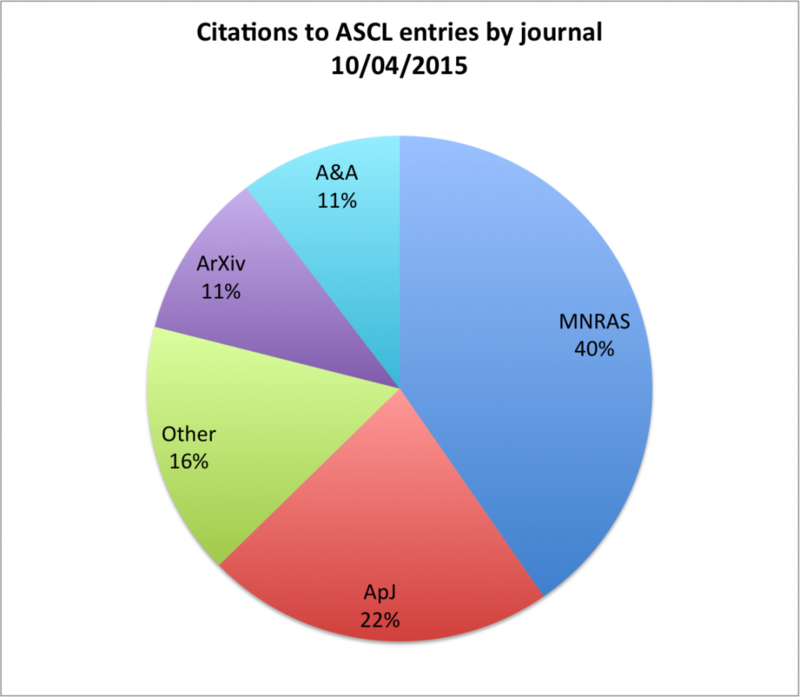 Seventeen percent of ASCL entries had been cited in October 2015, and as of today, over 29% of ASCL entries have citations. Of course there are other ways to cite software, and the ASCL supports all citable methods and ASCL entries include preferred citation information where possible. 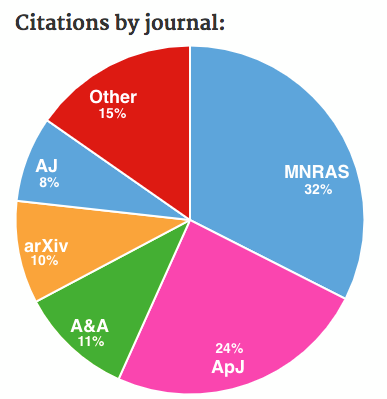 Do we list how your software should be cited? If not, please let us know your preferred method and we will add it to the entry! This entry was posted in data play, news, stats on March 28, 2018 by Alice Allen. … maybe not like topsy, but steadily nonetheless. 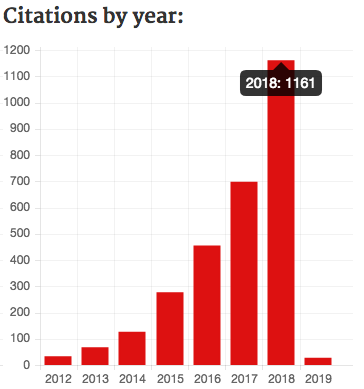 In looking at the ASCL’s growth over the past year, I see that on June 15 of last year, ADS held 818 ASCL entries with 168 cumulative citations. 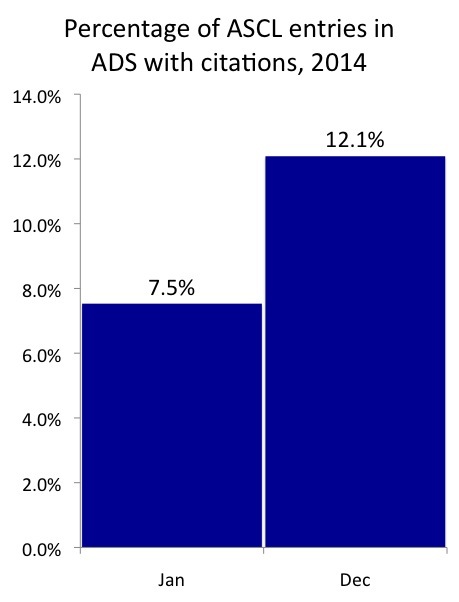 78 different codes had been cited by their ASCL ID, or 9.5% of codes in the ASCL. 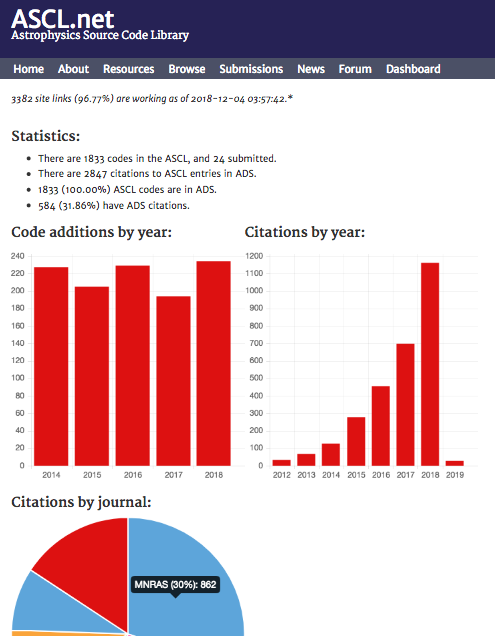 Today, there are 1079 ASCL records in ADS with a total of 334 citations, nearly double last year, and the number of codes cited by ASCL ID has just more than doubled; that number now stands at 158, which is 14.6% of codes in the ASCL cited using the ASCL record. So if my figuring is correct (no guarantees…), the ASCL has grown 32% in the past year (by 261 codes, from 818 to 1079), while codes in the ASCL cited by these entries is up 100%. We are very interested in code citation, however that happens; we want software authors to gain exposure and credit for their work! 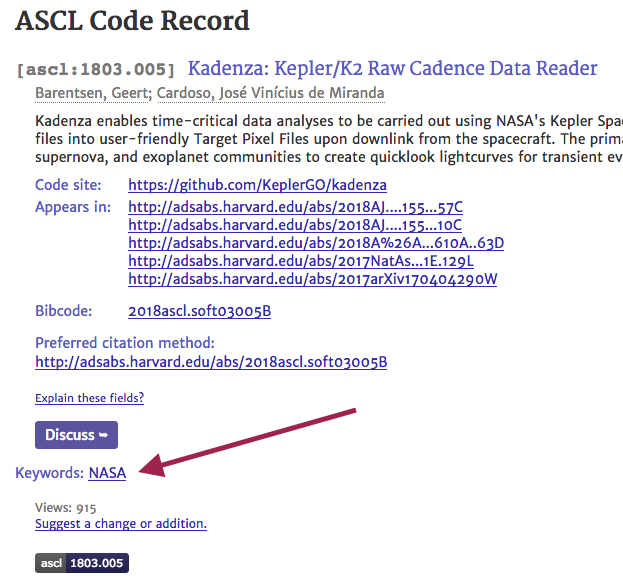 A number of excellent ways to cite codes exist, and so long as codes do get cited, we don’t care how. We track citations to ASCL entries because this is one way to determine whether the ASCL is being used; page views are another measure we employ. And yes, it’s being used. Yay! Thank you! This entry was posted in codes, stats on June 14, 2015 by Alice Allen. This entry was posted in codes, news, stats on January 10, 2015 by Alice Allen. 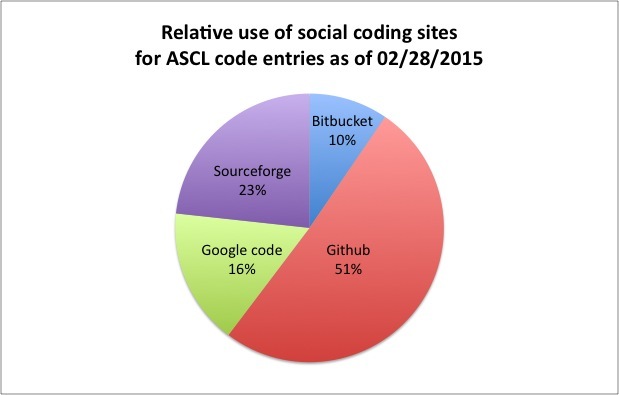 That means 11% of codes indexed by the ASCL are hosted on a public site conducive to social programming. That’s higher than the 7% from two years ago (by coincidence, almost exactly two years ago) and not unexpected, given the growth of GitHub. 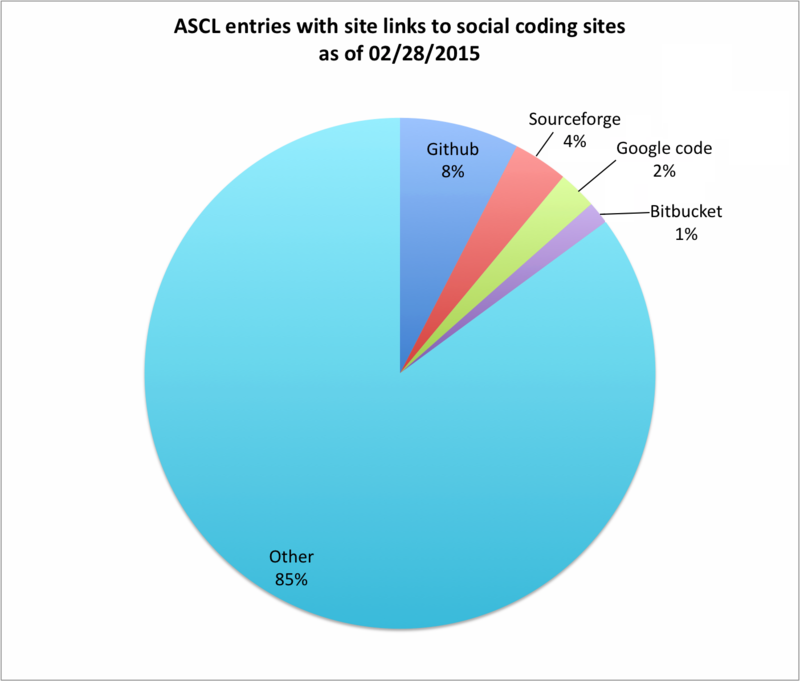 Fewer than 1% of ASCL codes were in GitHub two years ago (only 3 at that time — wow! ); now there are 32 hosted on GitHub. For comparison, there were 14 codes on SourceForge two years ago, so while that number has doubled, the growth in use of GitHub is obviously much greater. 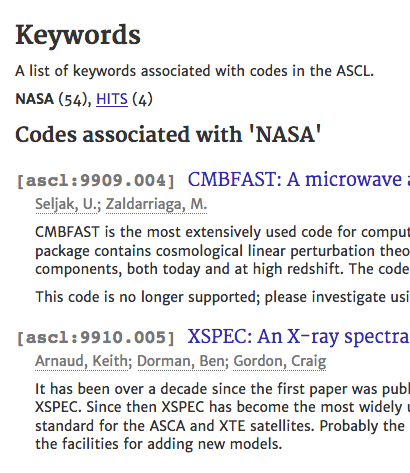 Though stored on sites conducive to collaboration, most of these codes are not big collaborations; the majority of codes in the ASCL in these repositories have 4 or fewer authors. I expect the percentage of codes on such sites to grow as more people use these tools for versioning; I think those who use such tools may also be more open to sharing their codes and advertising them (via links in papers if nothing else), making them easier to find/register in the ASCL, too. This entry was posted in codes, stats on February 9, 2014 by Alice Allen. 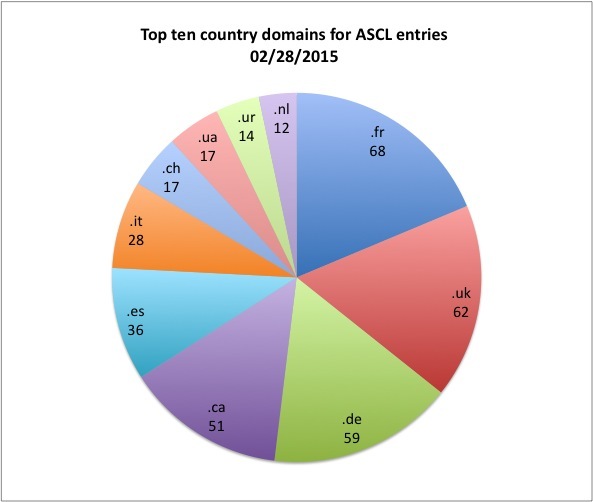 Idly browsing through Google Analytics statistics on the ASCL, I pulled out pageviews by country, these just of the ASCL forum on Asterisk for this month so far. Of the 4,843 pageviews, 1,939 (40%) are from the US, which means of course that 60% are not. 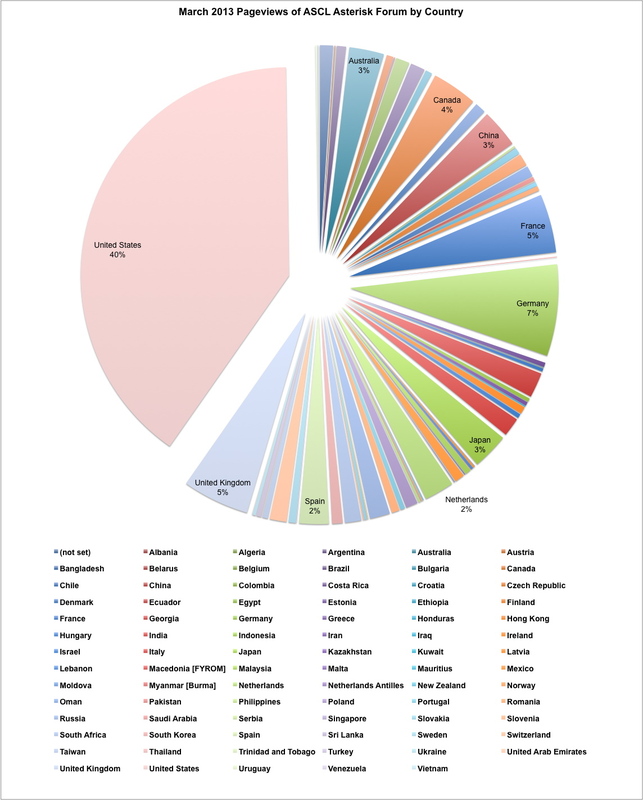 People from eighty-three countries have accessed the code entries forum; I’ve tagged the pie slices below of the ten countries with at least 2% of the total pageviews. Click on the pie to see the chart at full size. This entry was posted in codes, news, stats on March 22, 2013 by Alice Allen. Page rendered in 0.552 seconds. Blog powered by WordPress.